While it seems to be a pretty simple question, but if you are using Adobe Reader AND you are filling a fillable PDF form (with the above warning), most probably that you are scratching your head and ask yourself ‘How do I save this darn thing?‘. 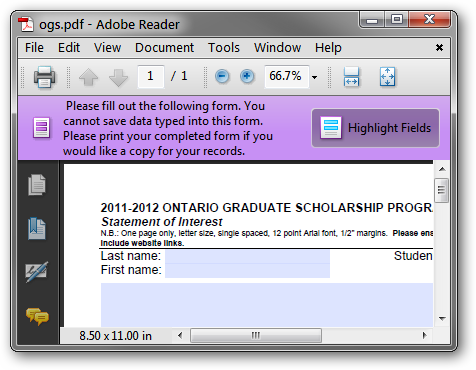 Of course, if the fillable PDF is created in an appropriate way, Adobe Reader user will be able to save a copy of the filled form. Nitro Reader – A pretty new PDF reader and it is impressive since first release. You can save fillable form as normal form or flattened version. PDF-XChange Viewer – A long time third party PDF reader with a lot of features – saving a fillable form is one of them. PrimoPDF – Highly recommended. Easy to install and easy to use. CutePDF – Simple and easy application. So that’s it! Happy form filling! Try if you have internet access http://www.pdfescape.com/ its free and allows a lot of things and you can save your file on and offline, print, edit, and more check it out! I use lots of time to fill in application and add my signature to the app for faster, friendlier, way of fill out paperwork!